Wandering Glider, Droid Shots, Minneapolis, Minnesota, July 2014, photos © 2014 by QuoinMonkey. All rights reserved. Dragonflies have existed for over 300 million years. According to the Migratory Dragonfly Partnership, about 16 of the 326 dragonfly species in North America are regular migrants, some traveling hundreds to thousands of miles each year. 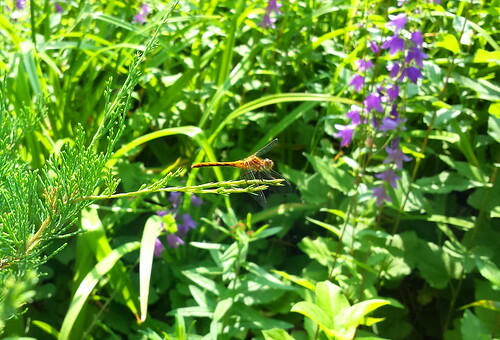 The major migratory species in North America are: common green darner (Anax junius), wandering glider (Pantala flavescens), spot-winged glider (Pantala hymenaea), black saddlebags (Tramea lacerata), and variegated meadowhawk (Sympetrum corruptum). Learn more about the mystery of dragonfly migration at The Nature Conservancy piece, Dragonfly Migration: A Mystery Citizen Scientists Can Help Solve, and at Dragonflies That Fly Across Oceans, a TED talk by biologist Charles Anderson.